Pressure-resistant Seeflex 060ES is a clear, ether-based thermoplastic polyurethane alloy with an internal polyester scrim. 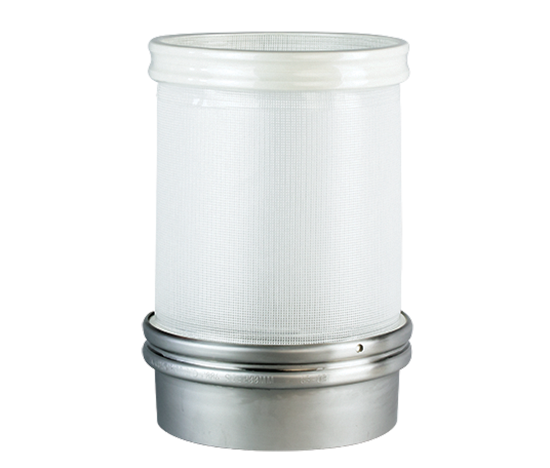 The internally bonded scrim restricts the Seeflex sleeve from stretching and provides superior pressure resistance. IMPORTANT NOTE: Seeflex 060ES is designed to resist extremely high pressure and therefore it should not be used where the connector is intended to act as a pressure-release point. * Engineering adjustments should be made for changes in diameter. For length adjustments or non-static applications, contact ARL Products. 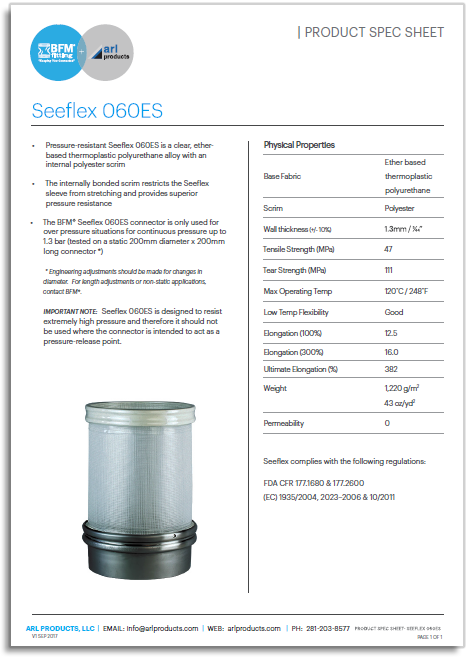 What is the maximum operating pressure for Seeflex 060ES? The upper limit we recommend for Seeflex 060ES is 1.3bar, although it has been tested well in excess of this. This figure was from tests undertaken on a 250mm diameter connector 200mm long at ambient temperature. Connector diameter, length and operating temperature will affect maximum operating pressures. Please refer to our Operating Pressure Guide document. Is there a maximum connector length for the Seeflex 060ES? Yes - the maximum connector length for Seeflex 060ES connectors is 1,000mm (39 1/2 inches). For tapered connectors, the maximum length we recommend is 800mm - please contact us for any requirement over this as we may be able to help depending on the application. Can you get tapered connectors made in Seeflex 060ES? Yes - you can order tapered Seeflex 060ES connectors up to 800mm (31 1/2 inches) in length. If you have a requirement for anything over this length in a taper, please contact us first as we may be able to help, but there are some manufacturing limitations on this material. Can I still buy Camlon connectors? We have replaced our pressure-resistant Camlon product with our new Seeflex 060ES product as we believe it has superior performance. However, if you do specifically want Camlon, we can still provide connectors in a limited range. Can you get Seeflex 060ES with rings? No - we cannot make a Seeflex 060ES connector with rings.